Danny Pensive Comic Strip #1 | Rocket Steps. The art of communication. 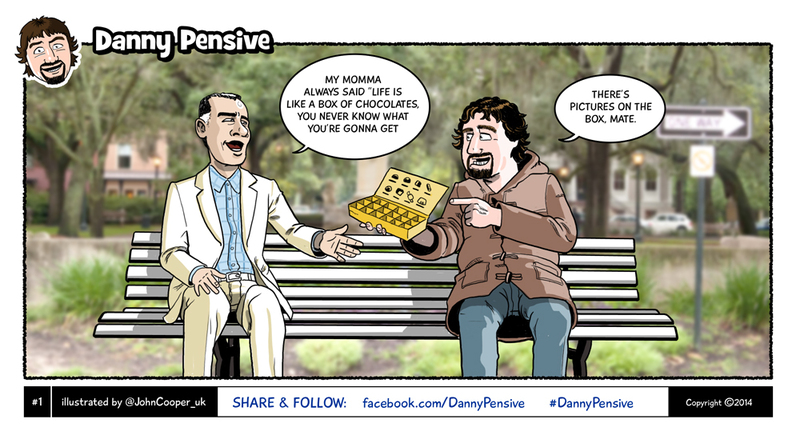 Danny Pensive has been watching me doing other strips for a while, “You could do a strip about me” he said. “But I’m always busy” I said, it’s enough work to do the ‘Best Job’ strip to a reasonable deadline. “But it will make you happy, and generate material, and help consolidate the small but loyal following you have, and then in years time you can print them off and sell them at gigs coz not many other comics have their own strip”. So they you go, and here you go.